The first in a series of elobeatlesforever (elobf) articles discussing selected ELO songs. 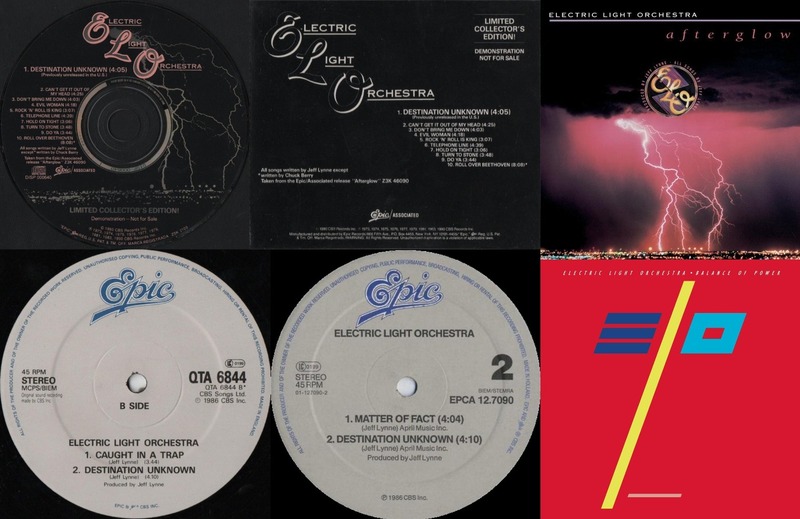 Many fans of the Electric Light Orchestra hold the 1990 US boxed set compilation "Afterglow" (Epic Associated Z3K46090) in high regard, not least because it included several of the unreleased tracks from the originally intended "Secret Messages" 2LP including "Hello My Old Friend", "Mandalay" and "No Way Out" alongside UK 'B' sides such as "Buildings Have Eyes", "The Bouncer" and "Buildings Have Eyes", trax previously unavailable in the States at that time. Interestingly, it was "Destination Unknown" - a song also included in "Afterglow" - which was an unlikely if not surprising choice of title track for a ten track limited edition CD (ZSK2109) put out by CBS to promote the 3CD anthology. "Destination Unknown" first appeared on the UK 12" single for "Calling America" (QTA6844) in 1986, sharing the flip side with "Caught In A Trap". It also appeared on the Dutch 12" single for "So Serious" (EPCA 12.7090) with "Matter Of Fact" before being included in the excellent remastered and expanded "Balance Of Power" CD in 2007.